It’s an approach that elevated him into the top of Texas business and politics in his youth, helped him inspire a new era of philanthropy in the Roaring Fork Valley and was a source of admiration, amusement and consternation to those closest to him. Connie came into Jim’s sphere of influence at the end of a winding road that lead through Kirkland, Washington, New York City — where she landed a solo part at the Philharmonic under Leonard Bernstein and Rudolph Steiner at the age of 22 — and Vienna, where a couple she met in a box at the opera encouraged her to check out Texas. Her accomplishments there included bringing an arts education program through the Lincoln Center Institute to Houston. “We took teachers through the process of creativity,” she explained. She first remembers meeting Jim when she took a job marketing high rise condominiums, and he came to inquire about the penthouse. It was finally Connie who took the initiative by placing a trio of ballet tickets on her desk for him to notice, then asking him to join. She ended up living in that penthouse. Jim was the state organizer for the American Civil Liberties Union, but also did a stint as Chair of the National Democratic Presidential Victory Fund, which was earmarked for whichever candidate won the primary — in this case, Dukakis. But when it came time to retire, Jim wanted to get away from Texas and give his sons space. Both Jim and Connie had connections to the Roaring Fork Valley and had been vacationing in Aspen for several years. Connie, in particular, had an affinity for the Crystal Valley, and her brother had even owned the Yule Marble Quarry for a time. She remembers one Christmas staying at the Redstone Castle and coming back from dining at the Inn with a sleigh ride through fresh snow. He continued to sail, albeit in a 19-foot boat at Ruedi, and had a friend bring up catfish for a fry every year. Pretty soon, the Calaways began to make new connections. 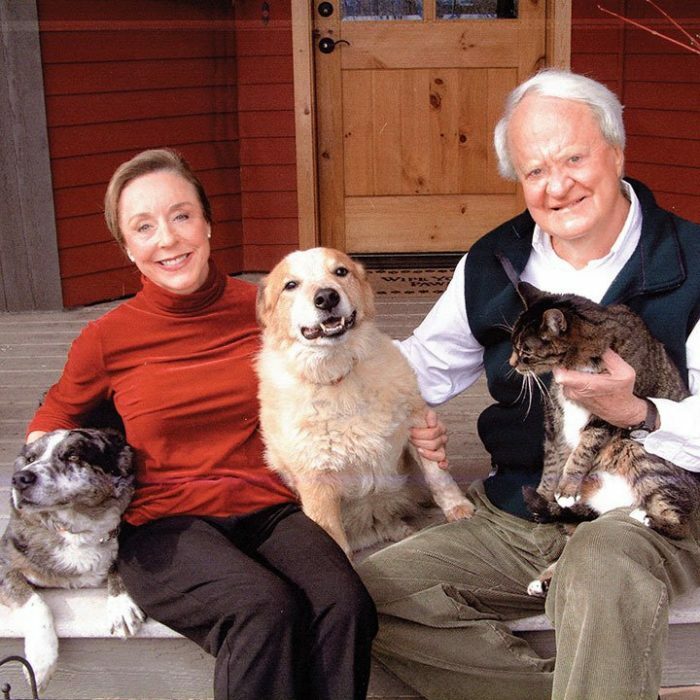 Connie became involved with the Colorado Mountain College board, which led to a partnership with Colorado Animal Rescue. Jim formed a friendship with Alpine Bank Founder Bob Young, who was the chief philanthropist in the Carbondale area. He also set out to inspire others to give. “Jim put his name on everything, which I found embarrassing,” Connie observed. “He did, however, know what he was doing because it wasn’t long before a lot of people began following in his footsteps. While Jim Calaway may be gone, there are no shortage of people to carry on his legacy. Just ask Alex Yajko, a close family friend by way of CMC. That started when the Calaways first moved into town, and Jim called Howard up to “request” a lunch meeting. It became a tradition, and Howard made an indefinite gift of them for Jim’s 75th birthday. While many of his frequent lunch companions were fellow Democrats, he made exceptions for Donn Willins and others. “In today’s world, it seems like you have to agree with people to be friends, but Jim didn’t,” Willins said. That went for other issues, too, like hunting or buying purebred dogs. “The way Jim coped with things that which contradicted his value system was to find something definite about a person’s life that he could embrace,” Yajko observed. For all the praise his friends had for him, there were some eye rolls, too. For one thing, he was “socially curious,” as Howard put it. He also prided himself on being a matchmaker but never made a successful match. He had more success convincing his friends to overcome “unhealthy boundaries” like not allowing their dogs to sleep on the bed, and always asked about pets first when talking on the phone. When another topic came up, however, you might lose him. “At some point, he decides the conversation is over and there there’s just a click,” Howard said. That didn’t fly with Connie. “He once hung up on me when I was in China, so I picked up the phone and called him back — collect,” she said. While he was quick to embrace new things — like fancy socks — as if they’d been in his life forever, he also kept a rigid schedule. He’d get up at exactly a quarter to 8 every morning, listen to the New York Times and make sure his lunches and porch time were scheduled two weeks in advance. He was picked up for the Pour House at a quarter to noon, where there’d always be a cowboy to help him across the uneven floor to the table with his name on it (there’s a Calaway BLT, too — it has a fried egg). After a nap at home, he was ready to “hold court” on the porch at 3 p.m. before watching the news and listening to his audiobooks or perhaps some gospel and heading to bed. The Sunday schedule was a little different to accommodate Two Rivers Unitarian Services for the Baptist-turned-Buddhist. Jim Calaway’s memorial will take place at 10 a.m. Feb. 2 at the Orchard before moving to the Third Street Center at noon. First Friday, Feb. 1, is also being themed in his honor, with adoptable pets at the Pour House and Marble Distilling leading into a week of free adoptions at CARE. And for the entire month of February, drop boxes will allow budding philanthropists to support some of Calaway’s favorite causes in the inaugural “Calaway Give-Back” event.